Revealing Nature’s secrets hidden inside us. If you want to feel much stronger, look much younger and live much longer, you are lucky to be here. Trying to find out the truth about health for myself, I made the fascinating scientific discovery of the four internal forces, which totally control health and longevity without a healthy lifestyle. I gave all of them the names as mineral balance, pH balance, glutathione balance, and bacterial balance. To my mind, health and longevity don’t demand a healthy lifestyle. Everything is healthful and everything is harmful, a norm in everything — is the key to strong health. This norm looks like a golden middle, as Russians say, meaning an invisible border between wisdom and stupidity, positive and negative, black and white, strong and weak, healthy and sick. So, any knowledge is only a power when it is presented as a system or, as scientists say, a science. Putting a gigantic amount of disembodied data on health as a negative and destroying force into a positive system, I pretend to be the one who provides you with the unique practical guidance as a golden middle for your true health and longevity. All we need to do to stay healthy is to cherish 4 basic energy forces at the same time by keeping them in balance, in harmony with each other and at a proper, but absolutely different level, which is individual for each of us. Shortly speaking, if you don’t take care of all of them at the same time properly, you do nothing good for your health. However, in fact, all of you are just taking care of 2 or 3 of these 4 internal forces breaking a balance between all of them and demolishing your health. 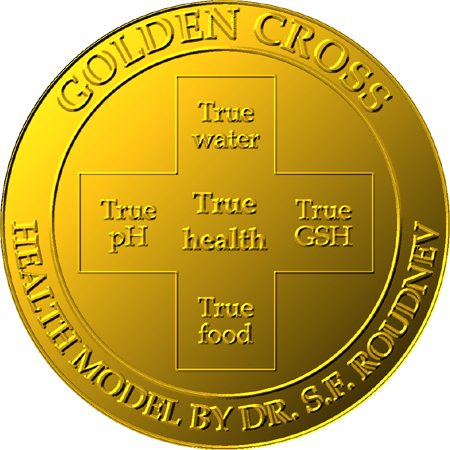 Any kind of food, due to the ingredients and molecular formula, belongs to one of these 4 forces of the “Golden Cross®”. A lot of foods are different in color and taste but are very common in ingredients, so eating different foods does not mean eating properly and efficiently. Moreover, your individual level depends not only on age or genetics but also on the nature of the special internal waves, which has been discovered by myself in the human body. In my opinion, the genetics itself is based on internal waves dynamics that exists in every human body with individual features. I am probably the first scientist -oceanographer who observed a similarity between human and ocean. I suggest that the internal waves dynamics presented in any ocean, sea or lake as well as in the universe takes place in a human body too, in the same way, and as a basis of its unique entire nature. The fundamental knowledge of this science gives me the unique advantage to find and explain what nobody really can see in medicine as a whole picture. Let me introduce and explain a health model shortly. The healthy human body is an aquarium where 80% is water and 20% is 30 “golden fishes” — amino acids or protein. All we need to take care of health is simple. We have to change water and feed up fishes on time by using a true water and food and maintaining proper conditions as pH and GSH balance. There is a queen fish named GSH, which consumes only specific food named bonded cysteine presented in natural food in the complicated form that prevents effective absorption. Mineral balance. A real science about water recommends using two different types of water for inside and outside. For inside(cooking and drinking) — hard, with minerals Ca, Mg; and alkaline, pH=7. For outside(washing and shower) — ideal water is soft, without minerals, TDS=0 ppm; and acid, pH=5.5 The use of soft water for inside breaks a mineral balance and does increase the risk of heart and brain disease, obesity and osteoporosis, and many more. In accordance with “Classification of water for life” by Dr. S. F. Roudnev all water for sale at a store has to be labeled as the water of two different types — type 1 and type 2. The most simple way how to get true organic®water, hard and alkaline, is to transform tap water right at the kitchen by using #1 superior water filter on the market today. I kindly recommend you superior water filter model MP880S. Acidity-alkalinity balance or pH balance. Human body cells need pH=7 to stay healthy. It keeps them protected against self-intoxication (severe toxins called free radicals and produced by the human body), viruses and pathogenic bacteria(delivered to body from outside or generated by inflammation); which don’t exist at pH=7. As a result, diseases linked to viruses will never appear. pH=7 prevents also pain and inflammation. The only ideal product to keep body cells at right pH=7 better than all others due to quality, safety and price is one unique drink. Providing with all minerals and a wide variety of botanical amino acids, product effectively eliminates pain in joints, muscles, back pain, headache, stress, and migraine. It is also highly effective to prevent stroke and heart attack by cleaning blood system channels and purifying a blood. This legendary drink also controls a pancreas which is mostly responsible for normal insulin, sugar, blood pressure, cholesterol, and weight. Without a healthy pancreas, it would not be a normal weight. Order unique product online (Your money back guarantee up to 90 days) — click here. Glutathione balance. Healthy human body has a natural and unique ability for self-protection against any negative impact as pollutants, heavy metals, toxins, poison, viruses linked to cancer and HIV, the infection and stress and even side effects of alcohol, drugs, and cigarettes. Cells produce unique remedy called tripeptide Glutathione(GSH). However, this ability is limited mostly by a deficiency of cysteine at a cellular level due to molecular bonds (connections between ingredients in the food we eat) which prevent getting full benefits from any food. The molecular connection is created by Nature to make a human circle of life much shorter without a chance to live longer. Thanks to only one unique product available on the market today we can change our life for the better and get the highest level of quality and longevity of life. It’s well known that longevity is limited by number 50, and we can do nothing with this maximum number of generations of our body cells. However, by using this product we can extend the period of life of all next generations. It means that if the extended period of cell generation life is 3 years, a person will live as long as 3×50=150 years and without diseases associated with aging. Moreover, by taking control of true GSH level, we will need less food to eat. True GSH controls the highest level of physical and sexual potency so that people will forget about unsafe stimulants like viagra forever. True GSH level takes care of genetical codes. And this is a reality in which anybody can take part immediately. Order unique Immunocal product online — click here. Why Glutathione for healthy people? This revolutionary method is based on establishing contact with the electromagnetic field of the human body through the use of nano-patches. In fact, through the electromagnetic field can be detected the features of the person’s soul. My scientific discovery says: “A man — is an intelligent form of existence of water with a unique set of individual vibrations of the soul.” Everything in nature has a direct and reverse side. So, using the food material, we continue to care only about the body. But, like the lake, everyone has the wave oscillations of the wide range of frequencies or periods, where the maximum period means longevity. These periods are the characteristics of his unique soul or, scientifically, it’s a wave nature of the human body. Combining food additives (for a body) with a nano-patch (for the soul) it is possible to restore a harmony between body and soul of a man. This is a harmony of the equivalent, but opposite forces in the human body, that means a true health. Caring only about the body with the help of nutritional supplements, or only about the soul (praying, meditation, yoga, hypnosis, and so on) — there is nothing good except negative extreme or illness. And any extreme — it is a sign of insanity or evil. The importance of probiotic is critical. In order to get benefits from properly absorbed energy, we need to maintain a bacterial balance. The healthy immunity is based exactly on a balance between “good” and “bad” bacteria. It would not be a healthy man without strong bacterial balance at all. So that immunity means bacterial balance. And the only way to get benefits from the food we eat is to consume probiotics permanently(kefir or yogurt is useless). Health — is a world of bacteria. In fact, 80% of immunity is under control of the intestinal system and 100% of it is under the control of bacterial balance. Bacterial balance is totally under the control of Probiotics. Any product can be delivered to you by Canada Post. Just let me know, what you need. Any donations from rich people, payments from customers or valuable gifts from grateful people successfully cured by my health model are accepted and have to be shipped by regular mail, Interac e-Transfer®, Western Union or Paypal, ... etc. I know you don't have to believe me. But the belief starts with a try. For those of you, who are suffering from low back pain as weak pain or dramatic severe pain with often loss of movement as well, I would like to give you a real gift as a natural remedy I successfully used for myself and my friends, which was discovered long ago( I guess in China and later forgotten almost forever), but medical doctors and family doctors don't wish to share it with you. So, in order to get rid of pain forever (because these two products will restore your damaged intervertebral disc in perfect size and condition as good as new!) , consume 2 natural products at least ones a day with a glass of pure water - Astragalus root and Colostrum (if you decide to read my book, you will know, how it works) for a short period of time from 2 weeks and up to 6 months (in severe case) together with a special exercises dedicated for spine relief (you can find Yoga video on internet at www.youtube.com ). But, if you start using only Yoga or anything else, the pain escapes just for a short period of time (because a disc is still damaged), but will be back to your low back sooner or later. The fact is, there is nobody on the internet today, who can recommend to you this method for total rehabilitation of your painful low back. All other methods, including acupuncture, are just sucking money from people. Tell me, if I am not right. The second recommendation is for so-called "baby-boomers". In order to prevent a vision loss and even fight cataract do just this - consume Carnosine. Third, this is for men with prostate problems. Remember the treatment of prostate would be more effective if the daily dose of Zink is not less than 50 mg. But most remedies offer just 15 mg per day. Finally. The more physically active you are, the more intense the deterioration of your body and the shorter your life. People are engaged in sports for three reasons: because of youth, because of stupidity and for the sake of money. So it's up to you. Buy my book on Amazon and you will get to know all you need to know about how to protect your health without illusive healthy lifestyle but keeping your bad manners to smoke and drink and feeling much stronger and living much longer. And even treat severe diseases including cancer. All rights reserved. Unauthorized distribution, transmission or republication strictly prohibited.